I haven’t written anything here in a month and a half and I wanted to get one more post in before my end of the year review that will probably come out on January 1 or 2, or whenever I motivate myself to review this year that was. I thought that Miller’s memoir was light and entertaining, though some reviews online were less than please with the amount of attention spent on her multiple failed relationships. The two of you that have been reading this blog since its inception will know about my own correlation between a toxic relationship demise and transforming from casual jogger into runner, and then the subsequent self-admission much later on. I don’t recall focusing on it much and I will not regale here. Suffice it to say I found Miller’s memoir hit close to home on some points but not in a PTSD sort of way. I wanted to read the Wunker and then won a copy at the season wrap of the Real Vancouver Writers Series. People complained in reviews that Notes is, well, notes. I liked it. I found it very pithy and wise with a Nietzsche-Gay-Science-esque quality of style. I was less attracted to the third part about feminist parenting because I have no interest in parenting. At all. 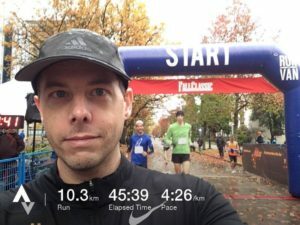 I ran the Fall Classic 10 KM and completed the RunVan Hat Trick, and while my time I cannot call disappointing I did run several minutes slower that the Turkey Trot 10 KM just a few weeks earlier. It is equally amazing and amazingly frustrating how quickly my stamina has diminished since cutting then quitting running while trying to nurse my knee back to not-hurting-all-the-time-except-when-running. If losing my endurance is the most frustrating, the annoyance that my knee hurt all the time since mid September except when I’m running, is a very close second most. I ran twice after the Fall Classic and then went to physio and ended up back at square one and I think my physiotherapist was as frustrated as me. So I took the rest of the month off. I’m slowly easing myself back into it. Slowly as in way to slow for my head, but a bit more quickly than my physiotherapist would like. I’m trying to find the balance of the two. That means that I’m not going to meet my goal of 2,600 KM in 2017, but I’m okay with that. I’m not great with that, but I’m already looking forward to 2018. The Vancouver First Half is just eight weeks away, and then the BMO Marathon is 12 weeks after that. Time to get my legs and lungs back.